How can sustainability professionals navigate the jungle of sustainability techniques and change processes? How do we know when to apply them successfully? Join us to learn a proven set of tools for helping individuals and organizations lead on sustainability. Classes start April 11th. 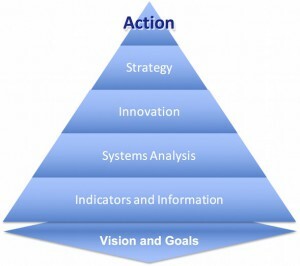 ISSP’s April course will guide you through the AtKisson “Accelerator” toolbox, based on the VISIS Method (Vision, Indicators, Systems, Innovation, Strategy) as a powerful, open-source approach to helping individuals and organizations lead on sustainability. VISIS is a proven set of workshop, training, and analysis tools for getting groups and organizations oriented to sustainability; facilitating collaborative learning and planning; and helping sustainability “change agents” to be better ambassadors and leaders. In this four-week interactive course, you will get a full introduction and virtual training in the use of these tools and methods by VISIS lead developer and ISSP Sustainability Hall of Fame inductee Alan AtKisson. AtKisson will explain the theory behind them, walk you through how to use them, and provide you with case studies and examples. This course is delivered online via four 1-hour live webinars and includes a 24/7 online 'classroom' experience. The webinars are scheduled for Wednesdays, April 11, 18, 25, and May 2, from 12:00 pm to 1:00 pm PT-US. Check your timezone here. Recordings of live webinars will be available for all registrants. *Registrants who are not ISSP members but hold current memberships in the U.S. Green Building Coundil (USBGC), Association for the Advancement of Sustainability in Higher Education (AASHE); Sustainability Tools for Assessing and Rating (STAR) Communities; the Urban Sustainability Directors Network (USDN); or the Association of Climate Change Officers (ACCO) may register using the ISSP Partner rate. You must use your institutional email address when registering in order to receive the discount.